Super Eagles coach, Gernot Rohr arrived in the country yesterday to begin preparations for Nigeria's 2019 African Cup of Nations (AFCON) last qualifying match against Seychelles, as well as the international friendly against Egypt this weekend in Asaba. The Super Eagles will host Seychelles in Asaba on March 22 and meet Egypt at the same venue on March 26. He noted that the Eagles' boss and his back room staff will use the two international games to start building the team ahead of the 2019 Nations Cup holding in Egypt. He added: "The Eagles coach and his assistants are already in camp, but the players will start arriving for the games on Monday (today). "Seychelles will arrive in Nigeria either on Wednesday or Thursday for the game." "I don't know where stories emanated from in some quarters that Rohr and the players are complaining about the Asaba pitch. "Right now, we have not had any complain from the coach. Before Asaba was selected for the two games, the NFF as a responsible body had enough conversations with the stakeholders in the game. 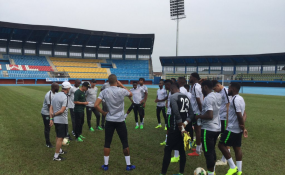 This is not the first time the players are playing an international match on the Asaba pitch," he declared.